The bike ride starts in the charming town of Isle sur la Sorgue, antiques capital of Provence, and made a tiny island by emerald waters of the Sorgue river. Completely flat, the scenic bike ride heads into a countryside of farmhouses, orchards and vineyards, on tiny country roads with very little traffic, and far from the tourist crowds. 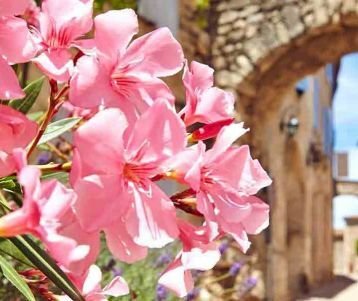 Your expert guide will lead you to the sleepy village of Le Thor (Saturday morning market) before circling towards the town of Pernes les Fontaines for lunch (Saturday morning market): a pretty village adorned with magnificent fountains and scenic squares. Wine tasting on the way in a small family-run wine estate. And with the Mistral winds at your back you make your way back to Isle sur la Sorgue to finish your loop. 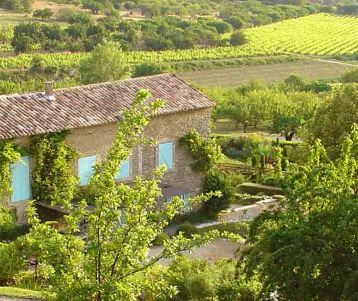 If you have time, tasting of typical delicatessen of Provence in Isle. Thursday & Sunday (big one!) are the morning market days in Isle sur Sorgue! Make sure to enjoy its great ambiance before you meet your guide and start your day ! The bike ride starts in the charming town of Isle sur la Sorgue, antiques capital of Provence, famous for its a superb Sunday-morning market. Its quays are lined with ancient waterwheels, and the whole village is made a tiny island by emerald waters of the Sorgue river, circling completely around it. After the town’s picturesque streets, we ride into the heart of the countryside. Quickly the town gives way to farmland: ancient farmhouses are set by apple and pear orchards, while table grapes are grown here too. Completely off the beaten-path, and devoid of hills, your guide will lead you on tiny country roads with very little traffic. You reach the sleepy village of Le Thor (Saturday morning market) with its impressive belfry. 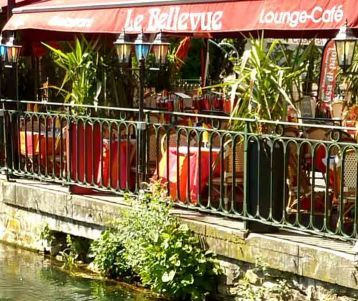 A top for a café by the Sorgue river? Continuing in the Provençal countryside you then reach the town of Pernes les Fontaines for lunch: a pretty village adorned with magnificent fountains and scenic squares. Wine tasting in a wine estate on the way (on opening days). And with your bellies full and the Mistral winds at your back, you make your way back to Isle sur la Sorgue to finish your loop. A delicatessen-tasting is included in Isle sur la Sorgue (on opening days). The ride is 33km long in total, flat, and almost exclusively on small country roads with no traffic.